Allison has already posted 69 tackles (50 solo) over four games with the Chieftains. He also has posted three tackles for loss, helping South Barber to a 2-2 record thus far. He had 23 tackles, including 20 solo, in South Barber's 46-20 win over Pratt-Skyline. Allison also has rushed for 443 yards and seven touchdowns. Eilert (6-4, 180) is the leading receiver for a Blujay team that has completed a four-year turnaround from an 0-9 season when their roster included just nine players. Eilert caught seven passes for 160 yards in the Blujay's huge win over state power Thunder Ridge last week. He'll need another good game this week against a Northern Valley team that heading into the season was expected to challenge for a playoff spot out of District 5. The Trailblazers' guys up front have plowed the road for Traevohn Wrench all season long. Gardner's offensive line helped to spring the standout tailback to 343 yards on 35 carries last week in a wild 56-51 win over Bishop Miege. This week the Trailblazers take on a good Blue Valley West team that has talent but has been battling injuries to start the season. Gfeller is the top playmaker for the Wildcats in his first season as a starting quarterback. He has completed 12 of 17 passes for 143 yards with a 3/0 TD/INT ratio. As well, he has rushed 45 times for 253 yards and nine scores. Gfeller is also 3 of 4 on kick extra points and has kicked a 35-yard field goal. Gfeller had his biggest game in a 36-28 Week 2 victory against Hoxie when he rushed 26 times for 133 yards for three scores, returned a kickoff for a TD and kicked a field and an extra point. He will likely need to have a big game as No. 3-ranked Wallace County takes on No. 2 Hanover in a key Eight-Man, Division II matchup at a neutral site in Natoma. 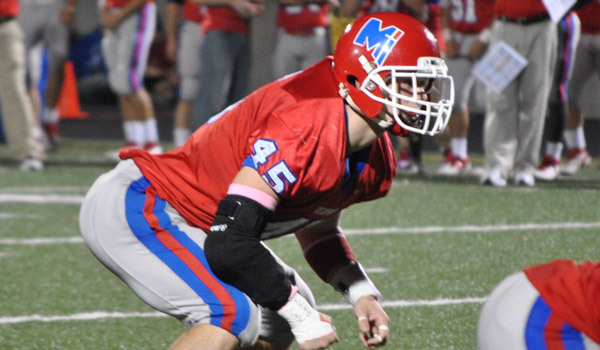 Ivey (6-2, 220) is the leader of the Miege defense and one of the top linebackers in the state. He is a two-time Kpreps.com All-State selection at linebacker and registered more than 150 tackles last season. This year, Brad is averaging 13.5 stops per game including seven tackles for loss and a sack. He should be primed for another big game this week as the Stags take on Blue Valley Southwest’s run-heavy offense. The Hesston (4-0) senior running back has produced video game like numbers on the 2013 season. He has 1,055 rushing yards on 55 carries, giving him a ridiculous average of 19.2 yards per carry. Schadler (5-10, 170) has 19 total touchdowns through four games, with 16 of them coming on the ground. First year Hesston coach, Clint Rider, called him the most gifted player he has ever been around. He has also a very successful track and field athlete, earning 4A all-state honors in the 100, 200 & Long Jump in 2013. Schadler turned in an impressive performance at this summer’s Shrine Bowl Combine including a 4.5-second forty-yard dash, 16 reps on 185-pound bench press, and had a broad job of 9'5.5. Look for a big night for him at home against Kingman on Friday.